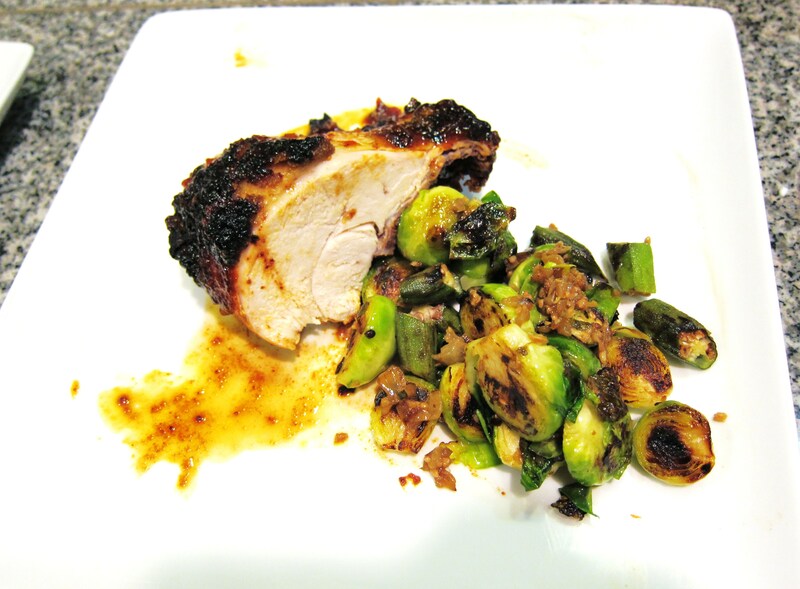 Curry BBQ Chicken with Charred Okra and Brussels Sprouts in Kimchi Paste — Top Chef Night | Eat.Drink.Life.Love. 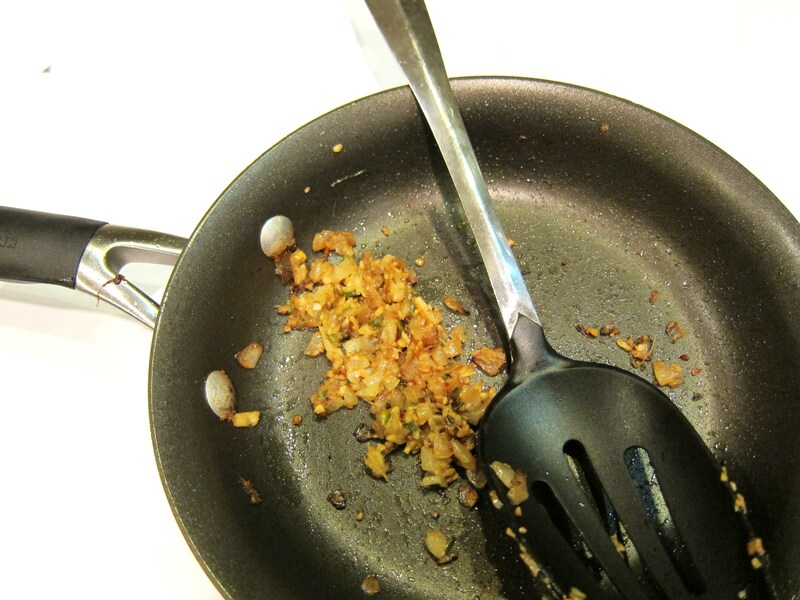 Using a “do-over” as a home cook can be frustrating, if not impossible. 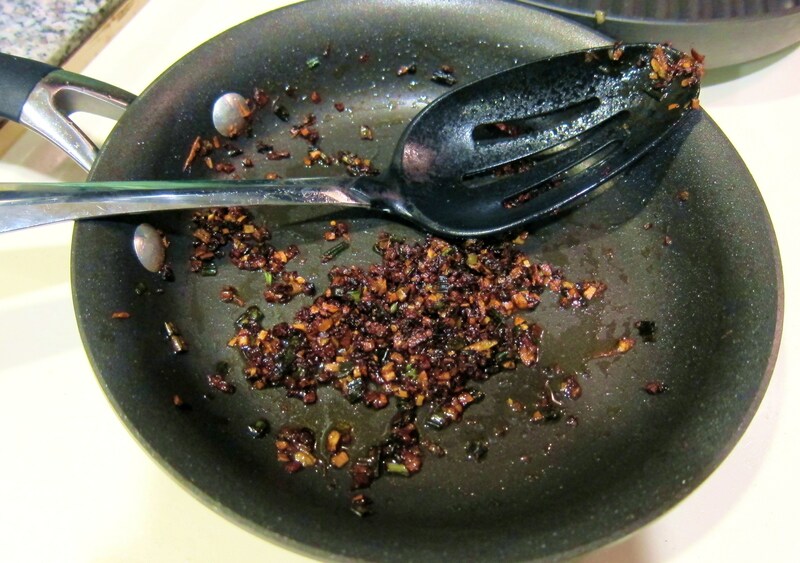 If something doesn’t turn out in a professional kitchen, they dump it out and start over because they wouldn’t serve food that was burned or didn’t taste right. When something doesn’t turn out in our kitchen, it sets into motion the “How Salvageable Is It” scale. Can I just scrape the burned bits off the bread? Do I need to cut an entire burned chunk off the bread? 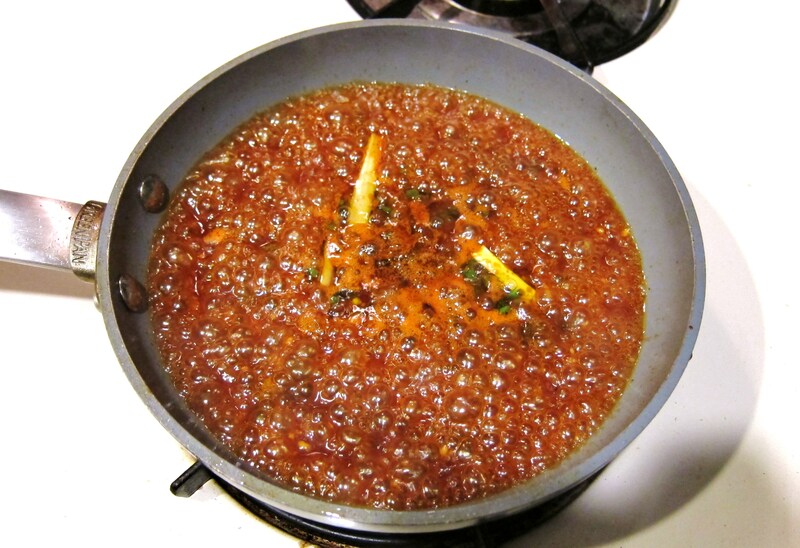 If I add enough vinegar and stock to this sauce, will that make it edible or will it still be a salt lick? If I have to dump it, do I have something to replace it with or are we just going to have sad dinner tonight? The “know when to hold ’em, know when to fold ’em” lesson came into play the night we made curry BBQ chicken with charred okra and brussels sprouts in Kimchi paste for Top Chef Night. As there are only two of us, we didn’t make an entire barbecue buffet of smoked brisket and pork rib along with the chicken, so we narrowed it down to reasonable portion sizes. The original Top Chef recipe for the dish as made by chefs Paul Qui, Lindsay Autry and Grayson Schmitz is here. We’re home cooks though, and here’s how that recipe actually goes down in our kitchen. Then I added enough room temperature water to cover the chicken, sealed the bag and put it into the refrigerator for the afternoon. Later in the evening, we gathered in the kitchen and let the barbecuing begin! I started the fish caramel while K rubbed down the chicken. I sautéed the shallots, lemongrass and green onions in a little extra virgin olive oil then added everything else in and let it bubble until it caramelized. This one’s to taste — if it tastes too sour, add a bit more sugar. If it’s too sweet, a bit more vinegar. If it needs a little bit more funk, add more fish sauce. Too much funk, add a bit more of everything else. BIG difference — you’ll notice neither of these things actually qualify as Kimchi or a paste, but that seems to happen with Top Chef recipes a lot. Meanwhile, the brussels sprouts and okra were ready to go into the grill pan. We were nervous about the okra. Neither of us had ever eaten it before and it has a reputation for being nasty and slimy unless it’s deep fried. But we cranked the heat, threw the vegetables into the grill pan and watched as they got brown and toasty. Then we tossed the hot veggies with the “Kimchi paste.” About 25 minutes into chicken cooking, the fish caramel baste started to get very dark so we covered the entire chicken breast with a foil “tent” to prevent burning. When the chicken was ready, we were glad we had. K chopped the giant chicken breast in half and we were ready for dinner. The chicken was tender and the barbecue sauce/fish caramel was nice and bright and flavorful — sweet and tart with the perfect amount of salt and char. The veggies were crunchy and tasty, with just the right amount of acid. And the okra was not slimy at all. It was mild and fresh. Would we make this again? Yes. There were a lot of components, but the fish caramel makes a delicious BBQ sauce and brining the chicken makes it very tender and juicy. 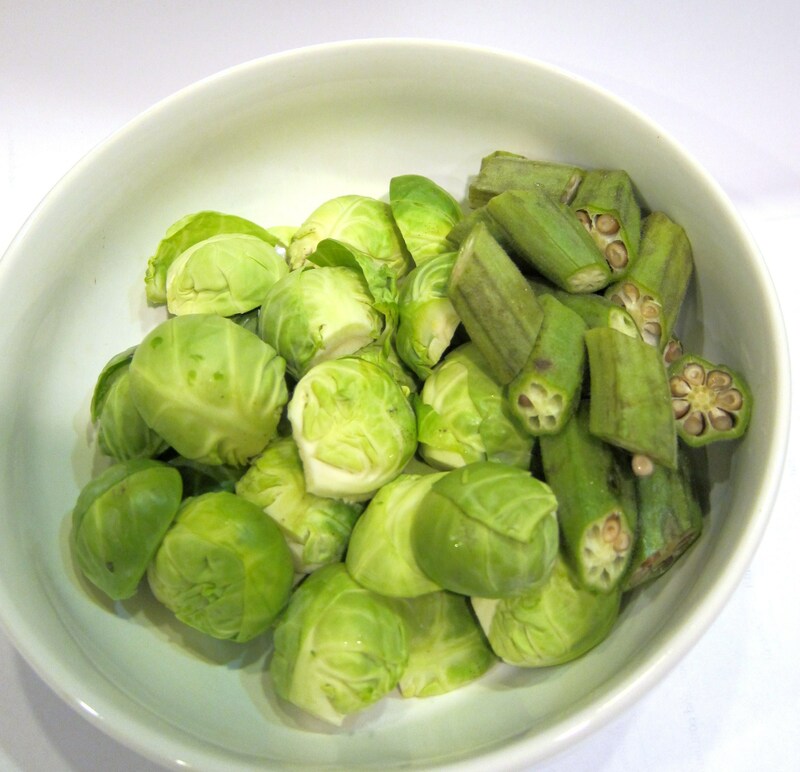 And since I’m a little bit obsessed with brussels sprouts lately, I’d definitely char and enjoy them again. Soundtrack: The Cars. Because Minneapolis makes Ric Ocasek smile. Question of the day: What’s your favorite way to make barbecue sauce? Asian style? Sweet sauce? Mustard sauce? Hot sauce? 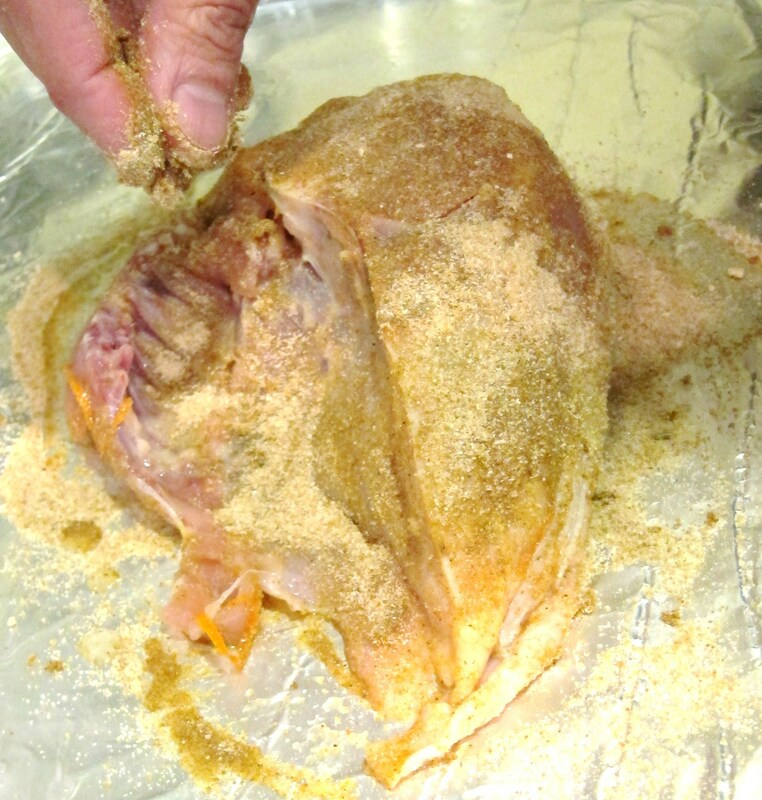 Dry rub? Booze? Do tell!